(CNN) — The line stretches the length of a narrow stone-paved street in the heart of the old quarter in Barcelona, Spain. Flanked on both sides by Gothic palaces, a diverse and cosmopolitan crowd waits its turn to admire the works of one of the greatest geniuses in the history of art, Pablo Picasso. It may not be the largest or the one that holds the artist's most celebrated paintings, but Barcelona's Picasso Museum boasts some unique qualities that earn it a place of honor in the Picassian world. This is the only Picasso museum which the artist himself helped set up: a tribute to the powerful connection to Barcelona that the Malaga-born Cubist kept throughout his life. "This is the only place where you can get a full vision of Picasso's formative years, we have a very comprehensive collection covering the years of his youth," says Malen Gual, the museum's conservator. Picasso regularly donated his works to the museum, including the "Meninas" series, the artists homage to 17th-century Spanish painter Diego Velázquez. "It is the only museum that keeps one of Picasso's thematic series in its entirety," adds Gual. 4 Gats: Barcelona's top bohemian hangout in the early 20th century. A short walk from the museum, and still within the Barcelona's old quarter, is another must for anyone retracing Picasso's footsteps. The cafe Els 4 Gats (The 4 Cats) still looks pretty much as it did in the early 20th century when it was the epicenter of Barcelona's artistic life and one of Picasso's favorite hangouts. It's here that Picasso held his first solo exhibition and, most importantly, where he met the local bohemia. Fellow, older, painters like Ramon Casas and Miquel Utrillo fascinated him with tales of Paris and the wider world. Picasso would indeed travel to Paris, eventually settling there and becoming the renowned artist we all know. But before all that, and to better understand how it all began, we need to head to the Catalonian countryside. The picturesque hilltop village of Horta de Sant Joan, surrounded by almond and olive groves, seems a world apart from the buzz of Barcelona's old quarter. Hardly any tourists make it to this off-the-beaten-track corner of rural Catalonia, some 150 miles southwest of Barcelona, and yet these landscapes played a massive role in the making of Picasso, the artist. Born Pablo Ruiz Picasso in Malaga in 1881, the teenage Picasso moved with his family to Barcelona in 1895. He signed up for art school, where he met Manuel Pallarés, a native of Horta. Not only would they become lifelong friends, but this encounter would prove providential. In 1898, young Picasso was going through a rough patch. He'd had a scholarship canceled and contracted scarlet fever. Longing for change, he accepted Pallarés' invitation to spend the summer with him in Horta. Rather than staying with Pallares' family, the two friends headed for the nearby hills, where they converted a natural rock refuge into a temporary home. They were to spend the next few weeks living in the wild, painting. Their only contact with the outside world were sporadic supply visits from Pallares' younger brother and the occasional visit to nearby farmhouses. This primitive lifestyle ended with the summer, but Picasso remained in Horta until early the next year, with an initial two-month stay stretching into eight months. This experience left an indelible mark on the young artist. He did not resume his art studies. Instead, he joined Barcelona's bohemian scene and embarked on a path that would lead him to develop his own style and become a pioneer of the Cubist art movement. Centre Picasso: A great place to start your trip around Horta. But this was not to be the end of Picasso's affair with Horta. He returned 10 years later, in 1909. Already a successful artist by this time, he was joined by a group of friends and his lover and muse, Fernande Olivier. If Picasso's first visit to Horta marked him personally, this second visit was to do so artistically. Picasso, who was already experimenting with Cubism, found in Horta the ideal place to consolidate his emerging unique style. The characteristic outline of Els Ports mountain range, with its clearly defined geometrical shapes, provided, together with the presence of Fernande Olivier, the right state of mind for him to enter a particularly productive period. A Pablo Picasso masterpiece has smashed the record for the most expensive artwork ever sold at an auction. CNN's Anderson Cooper reports. Picasso obsessively painted the nearby Santa Barbara mountain, in an apparent homage to Paul Cezanne's Mont Sainte-Victoire series. It's at that time his style showed an accelerated progression towards abstraction. In his Horta series, "Picasso ended up merging the mountain and the image of his girlfriend, perhaps in an attempt to combine his two loves, Horta and Fernande," explains Elias Gaston, the president of Horta's Centre Picasso. The Center doesn't hold any original paintings, but it has facsimile reproductions of Picasso's works inspired by Horta. Local spots connected to the painter are also conveniently marked with plaques, making it easier for enthusiasts to trace his footsteps. The landscape around Horta appears little changed since Picasso's time. Horta is one of the gateways to the Els Ports Natural Park, where the adventurous can visit the rock refuge in which the artist and his best friend spent that transformative summer of 1898. Gósol: Picasso went there by mule, but these days it's easier by car. But Horta isn't the only Catalan village where you can follow Picasso's footsteps in a majestic natural setting. Right at the foot of the Pyrenees, the charming mountain hamlet of Gósol, with its traditionally built stone houses and dramatic alpine scenery, couldn't be more different from the Mediterranean olive groves of Horta. Yet this is a landscape that's also closely connected to Picasso. The only way to reach Gósol in 1906, when Picasso traveled there in the company of Fernande Olivier, was a long and arduous mule ride. But this isolation and deeply rural atmosphere was to make a big impact on his work. "Picasso was going through a period of artistic blockage," explains Marc Bernadas, manager of Gósol's Gósol's Centre Picasso. "He was increasingly frustrated by the fact that he did not find a satisfactory way to complete the portrait of American art collector Gertrude Stein. When he came to Gósol he was looking for a getaway, a place where he could isolate himself from the social and artistic scene he frequented and find new sources of inspiration." And he found it. The 90 days he spent in the village drove Picasso's style further into primitivism and on the path to cubism. 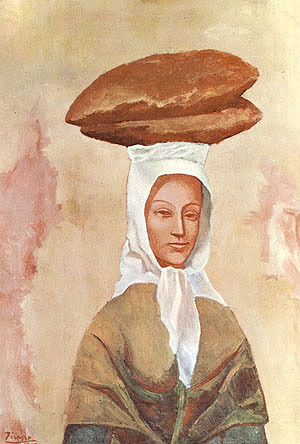 In particular, a polychrome 12th-century wooden Madonna he encountered at the local church is believed to have made a particular impression on his work, in particular his 1906 painting "Woman with Loaves." The Madonna is currently preserved at MNAC, Catalonia's National Art Museum. Catalan Romanesque art remained a constant source of inspiration for Picasso throughout his life. Although still relatively off-track, it's now much faster and easier to reach Gósol than in Picasso's time. You can even manage it as a day trip from Barcelona, about 90 minutes' drive away. The village is a gateway to the Cadí-Moixeró Natural Park and the twin-peaked Pedraforca mountain. Gosol's tiny Centre Picasso documents the artist's stay in the village and displays reproductions of some of the most significant works he completed during his stay here. Although Picasso last visited Barcelona in the 1930s and spent most of his adult life in France, where he died in Mougins in 1973, the intense experiences he lived in the city and the nearby villages during those formative years never fully left him. A quote often attributed to Picasso in his later years is, "Everything I know, I learned in Horta."